I went for something a little different with my manicure this week! After over two weeks, I finally removed my Shellac -- and immediately tried something crazy. 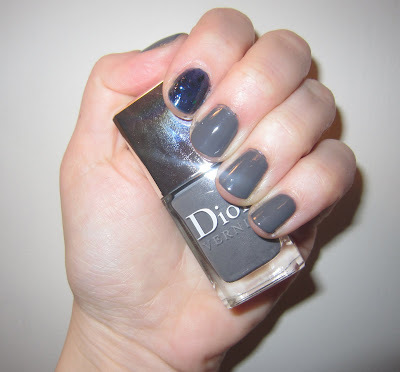 I painted nine of my nails with two coats of Dior Gris Montaigne, a gorgeously creamy charcoal ... and then jazzed things up with my index finger painted in three coats of Deborah Lippmann Across The Universe. Across the Universe is a teal-turquoise hybrid liberally packed with various sizes of glitter and shimmer that fall willy nilly across the nail. It's a color I'd been dying to get my hands on (pun intended) for a YEAR -- ever since I saw it backstage at Lela Rose last February -- so I'm super happy to finally be using it!